Like X-rays let doctors see the bones beneath our skin, "T-rays" could let art historians see murals hidden beneath coats of plaster or paint in centuries-old buildings, University of Michigan engineering researchers say. T-rays, pulses of terahertz radiation, could also illuminate penciled sketches under paintings on canvas without harming the artwork, the researchers say. Current methods of imaging underdrawings can’t detect certain art materials such as graphite or sanguine, a red chalk that some of the masters are believed to have used. The team of researchers, which includes scientists at the Louvre Museum, Picometrix, LLC and U-M, used terahertz imaging to detect colored paints and a graphite drawing of a butterfly through 4 mm of plaster. They believe their technique is capable of seeing even deeper. 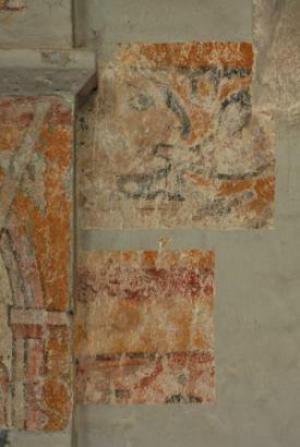 In March, the scientists took their equipment to France to help archaeologists examine a mural they discovered recently behind five layers of plaster in a 12th century church. "It’s ideal that the method of evaluation for historical artifacts such as frescoes and mural paintings, which are typically an inherent part of a building’s infrastructure, be non-destructive, non-invasive, precise and applicable on site. Current technologies may satisfy one or more of these requirements, but we believe our new technique can satisfy all of them," said John Whitaker, who is a research scientist and adjunct professor in the Department of Electrical Engineering and Computer Science at U-M. The device used for this research is a hybrid between electronics and lasers. It was developed by the Ann-Arbor based company Picometrix. It’s called the T- Ray" system, and it uses pulses from an ultra-fast laser to excite a semiconductor antenna, which in turn emits pulses of terahertz radiation. The rays permeate the plaster, and some reflect back when there is a change in the material. When they bounce back and how much energy they retain depends on the material they hit. Different colours of paint, or the presence of graphite, for example, cause tell-tale differences in the amount of energy in the returning waves. A receiver measures this energy, and the scientists can use the data to produce an image of what lies beneath. G rard Mourou, a U-M electrical engineering professor emeritus, said he believes this technique will be especially useful in Europe, where historic regime changes often resulted in artworks being plastered or painted over. This was common in places of worship, some of which switched from churches to mosques and vice versa over the centuries. "In France alone, you have 100,000 churches," Mourou said. "In many of these places, we know there is something hidden. It has already been written about. This is a quick way to find it." And Leonardo DaVinci’s "The Battle of Anghiari," for example, is believed to lurk beneath other frescos at the Palazzo Vecchio in Florence, Italy, Mourou said.